BR-DIM® SF utilizes BioResponse’s proprietary microencapsulation technology, also known as Phytosorb®. 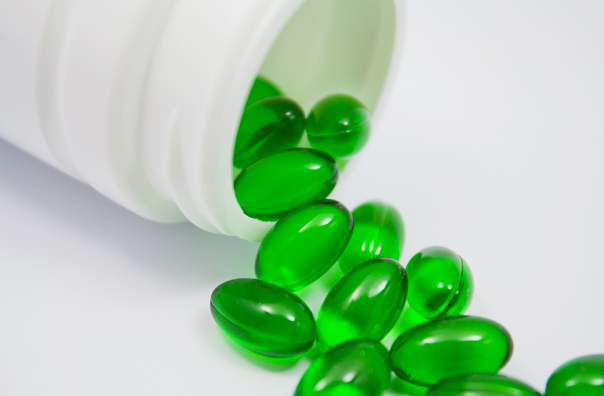 This microencapsulation process significantly improves the absorption of Diindolylmethane (DIM) to assure predictable absorption and sustained release of DIM. DIM is notoriously difficult to absorb and highly insoluble in water and oil. The Phytosorb® technology is the only process proven in clinical studies to enhance DIM absorption. 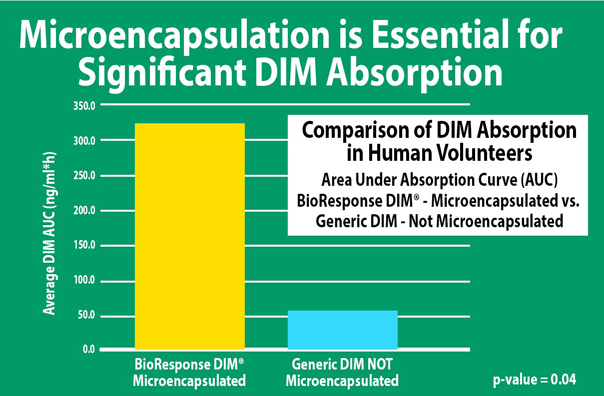 These summary charts show the results of a comparison study of DIM absorption from microencapsulated DIM versus generic, crystalline DIM. A group of male and female volunteers demonstrated the clear advantage from BioResponse DIM (BR-DIM) over generic crystalline DIM using repeat blood sampling. The same individuals took the equal mg doses of DIM from BR-DIM or generic DIM on separate days and provided timed blood samples over 6 hours. The results to the left demonstrate a statistically significant, greater gastro-intestinal absorption of DIM from microencapsulated, BR-DIM over generic DIM. The chart above shows the dramatically increased, averaged DIM blood levels from BR-DIM versus generic DIM. BR-DIM is the only DIM formulation that provides established, enhanced DIM absorption from supplements. Over 15 published studies have used BioResponse DIM (BR-DIM) and demonstrated bioavailability, safety, and tolerability. 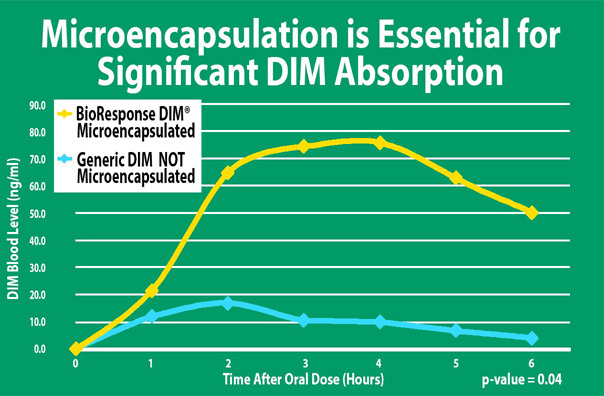 BR-DIM® provides an important formulation advantage which overcomes the lack of absorption of generic crystalline DIM. Based on this advantage and being the originator of bioavailable DIM, BioResponse has been awarded numerous US and International patents for new uses of DIM for health promotion and healthy aging in men and women. LEARN MORE about the BioResponse absorption advantage. 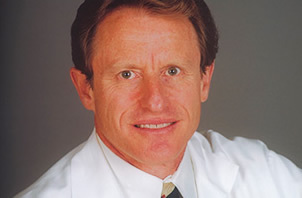 A natural approach to estrogen management. Customized professional labels are available using BioResponse DIM® from select licensees. BioResponse, LLC, the originator of microencapsulated BioResponse Diindolylmethane.